Football's fit and proper person test could be given more power thanks to a proposed new law being debated at Westminster on Friday. Conservative MP Damian Collins' Football Governance Bill would let the Football Association block potential club owners it considered unsuitable. Currently, new owners only have to pass an objective test based on company law. Collins' move has been welcomed by fans of clubs who have endured hard times under corrupt or incompetent owners. 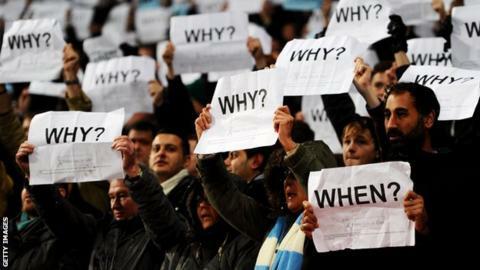 "We represent fans that in some way have been victims of the fact the (existing) test is a failure," said a joint statement from the supporters' trusts of Birmingham City, Coventry City and Hereford United. "We know the excuses; that the rules would be against the law. Yet, we know that isn't true. "Other organisations can ban people it believes are unfit, so why can't football make proper decisions to protect itself and clubs?" The football authorities have struggled to protect clubs from crooks and speculators for decades, repeatedly claiming that UK law prevented them from excluding people simply because they did not like "the cut of their jib". In 2004, the Football League and Premier League introduced fit and proper person tests, a light-touch approach that barred convicted fraudsters but remained short of the more subjective ownership tests common in sport in the United States. The tests, however, failed to stop Thaksin Shinawatra, a man on the run from Thai justice, buying Manchester City, or Portsmouth pass through the hands of four owners in one season on the way to bankruptcy. The embarrassment of those episodes, and others, led the leagues to beef up their rules, rebranding them as owners and directors tests in 2011. This move has not prevented the likes of convicted money-launderer Carson Yeung slipping through the net at Birmingham City, or twice-convicted fraudster Massimo Cellino from buying Leeds United. Supporters Direct (SD), the organisation that helps fans become more involved in their clubs, has long campaigned for a more robust ownership test and is urging the Government to back Collins' private members bill, which is fourth on Friday's House of Commons schedule for its second hearing. With Sports Minister Helen Grant already setting up an expert working group to make it easier for fans' trusts to buy their clubs, SD is optimistic elements of this bill could be become law soon. "The evidence clearly points to the need for change, and there is nothing in law preventing it," said SD's chief executive Robin Osterley. "The move to set up the experts group is very welcome, and this bill now stands as an opportunity for the Government to leave a real, tangible legacy on an issue that millions of people care about." Collins, the MP for Folkestone and Hythe, believes there is "growing momentum" for his ideas, and says that while it is unlikely there will be enough time before next year's general election to see his bill become law, he is confident it could become a manifesto pledge. As well as stricter rules for prospective owners, Collins also wants to make clubs publicly declare who their real owners are, and to abolish the controversial Football Creditors Rule that insists clubs and players are paid first and in full before any other creditor in the event of an insolvency. Is football fit for purpose? Read more on Is football fit for purpose?